Running a bunch of errands on a Monday holiday meant an outfit that could keep me comfy all day long. I have been practically living in this skier sweater from the J.Crew Factory. It’s crazy comfortable and makes me think of being up on a snow covered mountain about to take a deep breath and plunge down on my snowboard. Who can argue with that excited feeling? My outfits lately have been all about simplicity and comfort and these velvet pants certainly fit the bill. I loved them so much that I bought them in two other colors. 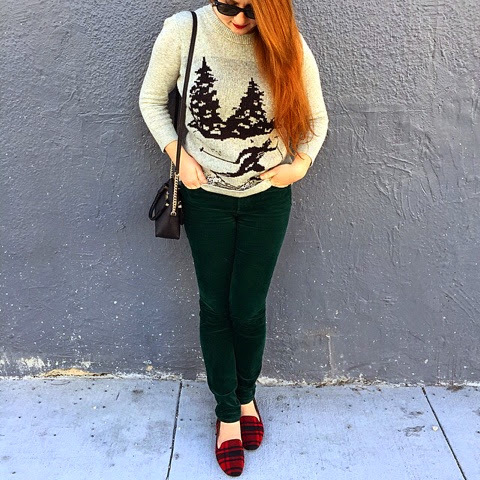 These velvet pants are perfect for dressing up and dressing down. This pair of shoes from Sole Society definitely give the outfit a pop of color and I love the the tartan pattern. There's something about velvet pants right? I adore them :-). I love those Tartan red shoes! I am loving that sweater myself. I'm actually thinking of heading to the JCrew Factory Store this weekend and I'll see if they have one like it there. I love love love this sweater it is seriously the perfect winter sweater. And I am obsessed with those pants too. Great style! Awesome, amazing sweater! I love this! I think it's a cute and comfortable looking outfit! This is so perfect! I want this outfit in my closet, now! 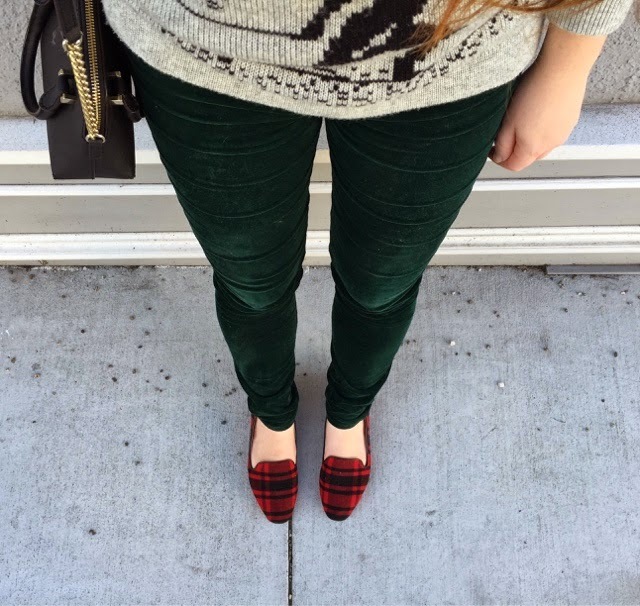 Oh my gosh those red tartan flats look so comfy! Super cute outfit! I love the tartan flats as well! Love this whole outfit! Those pants are amazing! Such a cute sweater. Now I am thinking about skiing!! Cute outfit and can't beat stylish comfort.